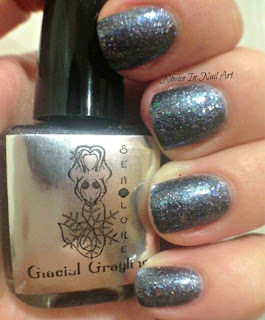 Today I have for you three polishes from Sea Lore's Wintry Friends collection; Glacial Grayling, Snowy Seal and Wintry Whale. I was once again drawn to the amazingness that is Sea Lore polish when she ran a special on them, which I was already struggling not to give in to, but after all the reminders on Instagram, I finally gave in. Oh how I'm not sorry I did!!! All 3 of these polishes can be worn on their own or layered over a similar supportive color. My swatches are here all solo. 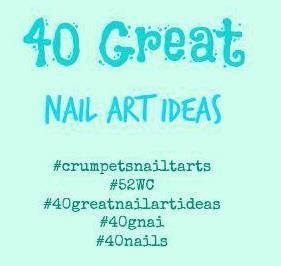 I also noticed that they have a slight texture to them when there's just 1 layer of top coat over them. A second top coat would smooth them out further, but I liked the way they felt. 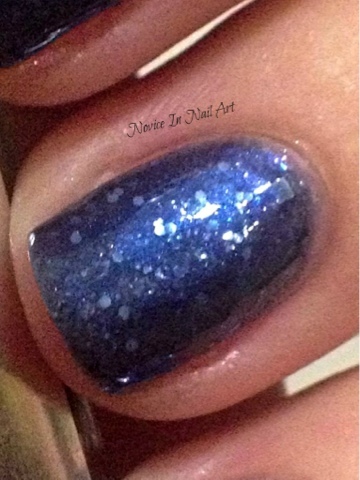 It was also nice to see how well the glitters settled on my nail, some of them landed on the free edge at the end of my brush stroke but it wasn't hard to gently push them back and they settled nicely back into the polish. 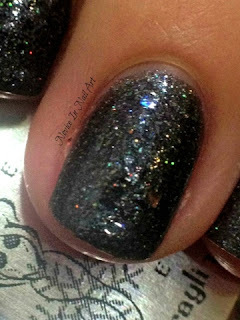 First up is Glacial Grayling - a beautiful downy feather gray base with medium square and multi-colored micro glitter. This is 3 easy coats with a HK Girl as a top coat. The formula was fabulous to apply, I didn't have to fish for the medium squares and it dried very quickly. 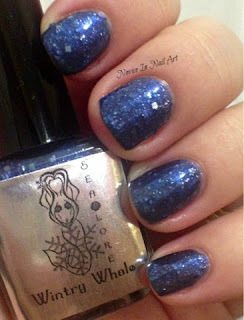 And last but certainly not least, is Wintry Whale - a deep gray-blue shimmer with a variety of blue glitter. Again, this is 3 coats with 1 coat of HK Girl over the top. I really loved how accurate this color is from the bottle to your nails - keeping the same look wearing it as it is on display. 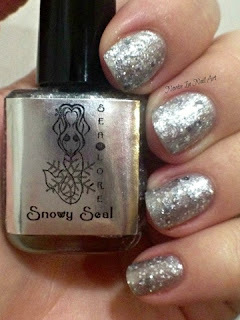 Being the blue girl that I am, I was not disappointed with this polish, however, I must confess that out of all of these, Snowy Seal is still my favorite. 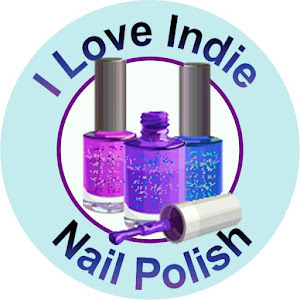 If you haven't checkout Sea Lore yet, you're missing out on a great indie polish maker with beautful products. I'm looking forward to her future creations.